In the second part of this chipping lesson we’ll look at playing chip shots from an up slope. 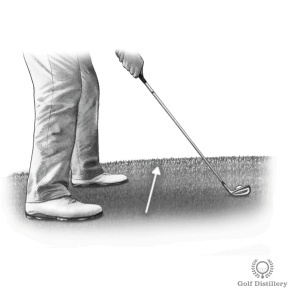 One of the most common faults I see amongst club-level golfers is that they don’t compensate for the slope by taking a lower lofted club – they still opt for the lob wedge or sand iron. Remember, an uphill lie will have the effect of adding loft to the club. Take a normal, good chip shot set up. 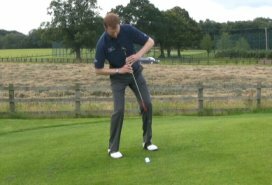 Adjust this by taking a slightly wider stance to help your balance. Tip your shoulders so that they are aligned to the slope – your spine should be at right angles to the slope. An up slope will have the effect of increasing the loft on your club. To compensate, take a lower lofted club than normal. A lob or sand wedge is probably not the best choice here as you’ll have to have the confidence to hit the ball quite hard all the way to the hole.